In each of the seven policy fields of SI-DRIVE (education and lifelong learning, employment, environment and climate change, energy supply, transport and mobility, health and social care, poverty reduction and sustainable development) in-depth case studies were conducted. Based on the theoretical framework and the empirical results of the global mapping, a total of 82 cases were selected and analysed. The cases were taken mainly from the existing database of the 1,005 mapped cases and nominated on the basis of the theoretical framework and the partners’ knowledge and experience (added by few additional cases of high interest). Practical points like access to and willingness of the initiatives to participate and a general regional variety were taken into account as well. 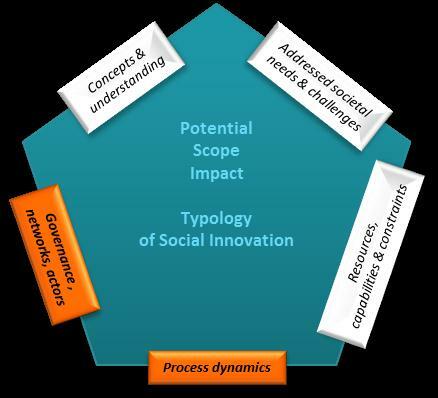 The focus of this qualitative research was on the dynamic interrelation between social innovation, the practice field and various mechanisms of social change. Therefore, the guiding meta-question for the case studies of SI-DRIVE focussed on mechanisms of social change reflected in the project’s five key dimensions, of which governance, networks and actors as well as process dynamics were of special interest, since they mainly examine which changes appear and by what/whom they are driven. Within these focused key dimensions and mechanisms of change, factors of success (and failure) were also elaborated leading to social change. The degree of social change was considered in relation to diffusion in society, degree of institutionalisation, imitation, the importance of the practice field and its initiatives, and the functions and roles of actors for everyday life and local communities. The case studies underline the holistic and overarching concept of most of the social innovations, integrating stakeholders from more than just one policy field (addressing e.g. education, employability and poverty reduction), different life spheres (e.g. work, family, leisure) and different sectors (public, private, civil). Social innovative solutions, in their great variety and typically through bottom-up processes, generate creative tension with national, regional and local policies or systems, leading to new ideas and solutions, further development and social change. Social innovations are initiated and implemented both within and outside the (formal) policy system, or they are hybrid solutions changing and modernising the system and (if they are successful) becoming more or less integrated into the system. In this way, social innovations can impact societal structures at different scales, as well as impart additional agency to the actors involved, and particularly to the beneficiaries at whom the solutions are targeted.